Sharjah Art Foundation in partnership with Experimenter Learning Program Foundation presents the eighth edition of the annual Experimenter Curators’ Hub. Running from 26—28 July 2018 in Kolkata, India, the Experimenter Curators’ Hub is a platform for developing and sustaining discourse on curatorial practice and exhibition-making through critical discussion and debate. Sharjah Art Foundation will live stream all three days of the hub on its website. In parallel, the foundation also invites attendees to view the sessions from Gallery 2 in Al Mureijah Square on 28 July on the hub’s last day. 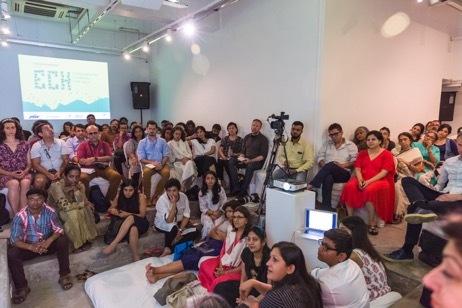 The foundation will host a networking brunch on that day, offering UAE-based curators, practitioners and members of the general public the opportunity to connect, followed by an interactive discussion with Kolkata during the closing panel, moderated by curator and art critic Murtaza Vali. Attendees will be given the opportunity to ask questions to this year’s participating curators. This event is free and open to the public. To register, click here. This partnership builds on Sharjah Art Foundation’s mission to support exchange and dialogue with local, regional and international art institutions and communities. With curatorial practice moving far beyond the museum and the scope of exhibition-making, cross-cultural discourse and international collaboration are vital. This year’s participating curators are Adam Szymczyk, Artistic Director of documenta 14, 2017; Jeebesh Bagchi, Curator of Shanghai Biennale, 2016; Bonaventure Soh Bejeng Ndikung, Founding Director of SAVVY Contemporary, Berlin; and Shumon Basar, Cultural Critic and Commissioner of Global Art Forum, as well as Erin Gleeson, an independent curator; Urbanists Prasad Shetty and Rupali Gupte; Kavita Singh, Professor of Art and Aesthetics at Jawaharlal Nehru University (JNU), Delhi; Sabih Ahmed, Researcher at Asia Art Archive; Léuli Eshraghi, Curator at the Institute of Modern Art in Mianjin; and Övül Ö. Durmusoglu, Curator at Hamburger Bahnhof, Berlin. The hub will be moderated by curator, researcher and writer Natasha Ginwala. Every year, Experimenter Curators' Hub invites curators from around the world to present their practice. The audience at the hub plays an active role in these presentations and contributes significantly to the conversations. The final day ends with a moderated panel discussion with all the participating curators. Sharjah Art Foundation’s partnership with Experimenter Learning Program Foundation will also include a year-round Sharjah-based iteration of the new and forthcoming Experimenter Learning Program (ELP) with annual workshops and learning modules on topics of contemporary and performing arts, curatorship, film, writing, language and social culture. To learn more, visit sharjahart.org. The Experimenter Learning Program (ELP) under the leadership of Priyanka and Prateek Raja is a long-term, multifaceted learning and education program that keeps visual culture at its root to build discourse around it. The program enables dialogue, discussion and debate in fields of contemporary and performing arts, curatorship, film, writing, language and social culture. The Experimenter Learning Program has a yearlong schedule that includes the annual Experimenter Curators’ Hub, workshops, salon-style classrooms, symposia, lecture performances and the Experimenter Juniors' Program. The Experimenter Curators’ Hub brings together some of the foremost minds in curatorship from all over the world. Founded in 2009 by Priyanka and Prateek Raja, the event is a crucial platform for developing and sustaining discourse on curatorial practice and exhibition making. Each year, ten curators, artists, designers and architects are invited to present and discuss their practice in depth through presentations on recent exhibitions they have personally conceived. Experimenter Curators’ Hub presentations and ensuing discussions are extensively video documented and archived as an online, freely-accessible resource offered to fellow curators, researchers, scholars, artists and members of the public.